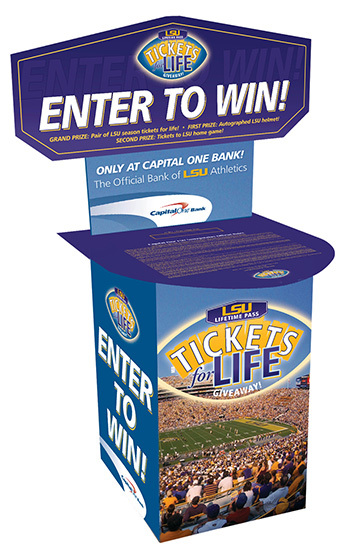 Assignment: My team was engaged to bring to life the sweepstakes for the bank's 2009/2010 LSU Athletics football sponsorship. This involved a drive-to-branch campaign with a grand prize of season tickets for life. This campaign was fully integrated, including in-branch display, on-site game day experiential marketing, and print advertising. 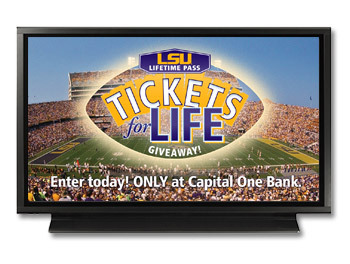 Debit card and credit card products co-branded with LSU Athletics supported the sweepstakes. 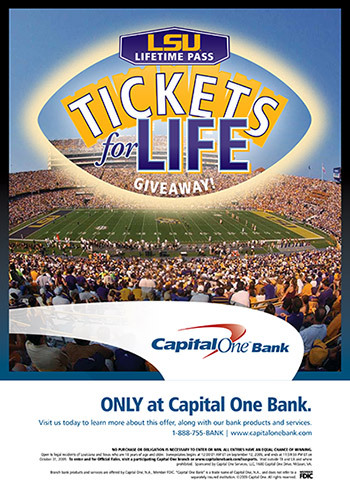 The 2009/2010 Football Season was the inaugural season for the bank as Official Bank of LSU Athletics. My team was tasked with creating an iconic in-branch set of collateral including an entry point. I worked with my art director to develop a logo and theme that could be used across a wide array of platforms: from in-branch merchandising to print ads to game day activation. My specific role on this project was creative strategy, concept development, and copywriting. Buckslips were handed out in the drive-up lanes at branches and on game day at Tiger Stadium. Banners measuring 3 feet by 10 feet were erected outside of high traffic branches. To increase visibility, I worked with my art director to develop a banner that would stand out from a distance.